Mr McFadden, whose company is regarded as one of the world's leading specialists in Greek and Roman coins, told The Times: "He did some work for Nino in the 1980s ... One doesn't refuse to deal with someone because he has a slightly shady background. "One looks at the deal on the table. We're business people. If there's any indication something's not legitimate, we don't deal in it." The investigation by customs officials surrounded two Greek nationals who are said to have tried to leave the UK carrying a substantial amount of cash. An investigation by Customs determined that the cash was payment for a coin that they had sold that morning to Classical Numismatic Group, of London. The cash was seized under the Proceeds of Crime Act, and Customs contacted the Greek Embassy. The executive director of the ACCG subsequently commented on the case (Leon Worden, "Ancient Coin Buyers, Beware: Even seasoned dealers can get stung", COINage magazine Vol. 42, No. 11, November 2006). Longtime coin dealer Wayne Sayles, executive director of the Ancient Coin Collectors Guild, agreed. "There is no tradition in the world market for the background-checking of sellers, nor is there any real reason for it," Sayles said. "There are pertinent and applicable laws in most countries that deal with import, theft, etc., and dealers do, in my experience, try diligently to follow those laws as they apply at the point of sale." Sayles lamented that "we may have lost an opportunity to contest a claim that seems to be arguable on several grounds." Readers will note the emphasis on the "pertinent and applicable laws" relating to the "import" of such archaeological material including coins. Indeed such "laws" will help to protect dealers from those who sell recently surfaced material. Thank you for publicizing my quote. It stands as true today as it did back then. I advocated following laws as they apply - do you advocate something different? I'm not sure where you are going with the CNG issue. They broke no laws that I am aware of and were apparently quite forthright and cooperative with the British authorities. I would think you'd be commending them rather than hurling rocks at them. 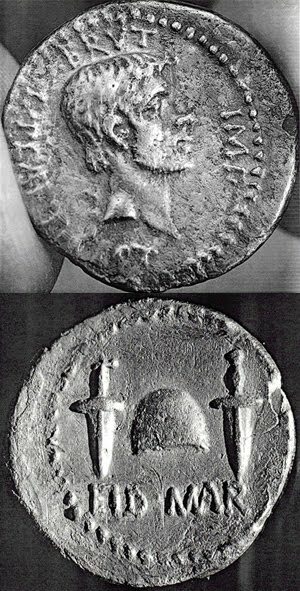 In any case, the Brutus denarius that CNG bought in England has no relativity at all to the request for import restrictions on similar coins into America. If there is a point to this post, I fail to see it. Yes, that case might have been a good case to challenge in court, but it's a moot point now that the ACCG is challenging the essence of draconian restrictions in another venue. I hope you'll save yourself the embarrassment of ressurecting that ludicrous claim that ACCG itself violated some law by launching a test case in U.S. Federal Court. That charge by one of your colleagues has already spun itself into oblivion along with whatever shred might have been left of the author's credibility. The denarius case reminds us that Greece has made claims on numismatic material. CNG has two offices: one in London (England) and the other in Lancaster, PA. Finally I do not understand your "straw man" argument about the ACCG Baltimore test case.